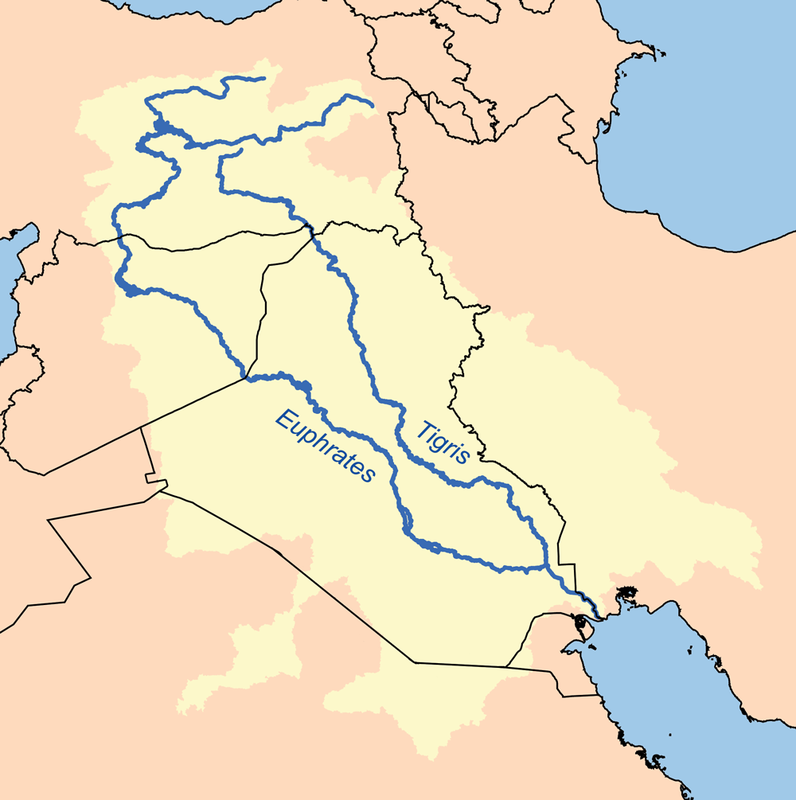 The regional toponym Mesopotamia ( /ˌmɛsəpəˈteɪmiə/, Ancient Greek: Μεσοποταμία "[land] between rivers"; Arabic: بلاد الرافدين، بین النهرین bilād ar-rāfidayn; Kurdish: میزۆپۆتامیا; Persian: میان‌رودان miyān rudān; Template:Lang-syr Beth Nahrain "land of rivers") comes from the ancient Greek root words μέσος (meso) "middle" and ποταμός (potamos) "river" and translates to "(Land) between two/the rivers". It is used throughout the Greek Septuagint (ca. 250 BC) to translate the Hebrew and Aramaic equivalent Naharaim. An even earlier Greek usage of the name Mesopotamia is evident from The Anabasis of Alexander, which was written in the late 2nd century AD, but specifically refers to sources from the time of Alexander the Great. In the Anabasis, Mesopotamia was used to designate the land east of the Euphrates in north Syria. 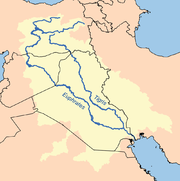 Mesopotamia encompasses the land between the Euphrates and Tigris rivers, both of which have their headwaters in the Armenian Highlands. Both rivers are fed by numerous tributaries, and the entire river system drains a vast mountainous region. 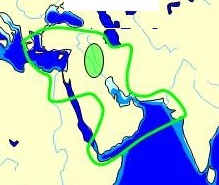 Overland routes in Mesopotamia usually follow the Euphrates because the banks of the Tigris are frequently steep and difficult. The climate of the region is semi-arid with a vast desert expanse in the north which gives way to a 15,000 square kilometres (5,800 sq mi) region of marshes, lagoons, mud flats, and reed banks in the south. In the extreme south, the Euphrates and the Tigris unite and empty into the Persian Gulf. The pre-history of the Ancient Near East begins in the Lower Paleolithic period, but writing began with a pictographic script in the Uruk IV period (ca. 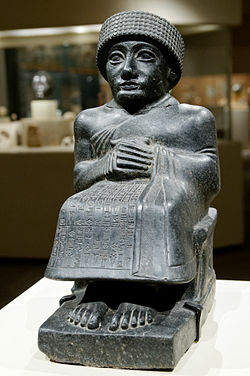 4th millennium BC), and the documented record of actual historical events — and the ancient history of lower Mesopotamia — commence in the mid-third millennium BC with cuneiform records of early dynastic kings, and ends with either the arrival of the Achaemenid Empire in the late 6th century BC, or with the Muslim conquest and the establishment of the Caliphate in the late 7th century AD, from which point the region came to be known as Iraq. 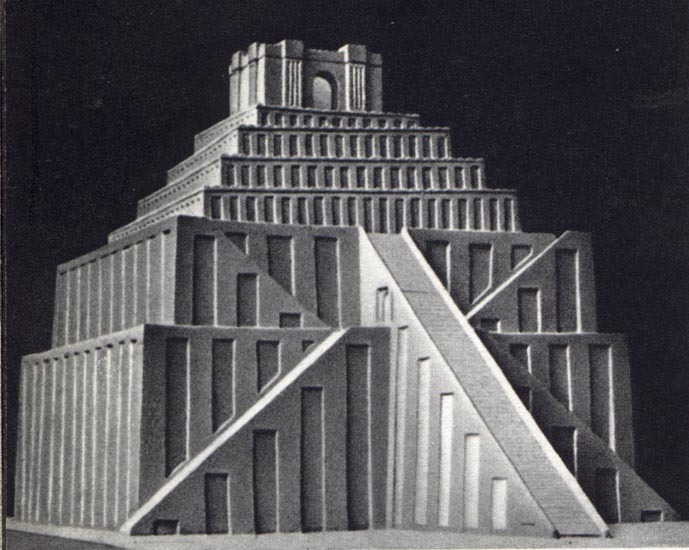 During this period Mesopotamia housed some of the world's most ancient highly developed and socially complex states. Studies have reported that most Irish and Britons are descendants of farmers who left modern day Iraq and Syria 10,000 years ago. 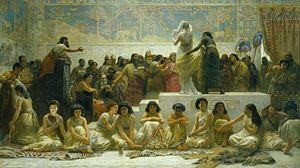 Genetic researchers say they have found compelling evidence that four out of five (80%) of white Europeans can trace their roots to the Near East. In another study, scientists analysed DNA from the 8,000-year-old remains of early farmers found at an ancient graveyard in Germany. They compared the genetic signatures to those of modern populations and found similarities with the DNA of people living in today's Turkey and Iraq. The early logographic system of cuneiform script took many years to master. Thus, only a limited number of individuals were hired as scribes to be trained in its use. It was not until the widespread use of a syllabic script was adopted under Sargon's rule that significant portions of Mesopotamian population became literate. Massive archives of texts were recovered from the archaeological contexts of Old Babylonian scribal schools, through which literacy was disseminated. Mesopotamian mathematics and science was based on a sexagesimal (base 60) numeral system. This is the source of the 60-minute hour, the 24-hour day, and the 360-degree circle. The Sumerian calendar was based on the seven-day week. This form of mathematics was instrumental in early map-making. The Babylonians also had theorems on how to measure the area of several shapes and solids. They measured the circumference of a circle as three times the diameter and the area as one-twelfth the square of the circumference, which would be correct if p were fixed at 3. The volume of a cylinder was taken as the product of the area of the base and the height; however, the volume of the frustum of a cone or a square pyramid was incorrectly taken as the product of the height and half the sum of the bases. Also, there was a recent discovery in which a tablet used p as 25/8 (3.125 instead of 3.14159~). The Babylonians are also known for the Babylonian mile, which was a measure of distance equal to about seven modern miles (11 km). This measurement for distances eventually was converted to a time-mile used for measuring the travel of the Sun, therefore, representing time. 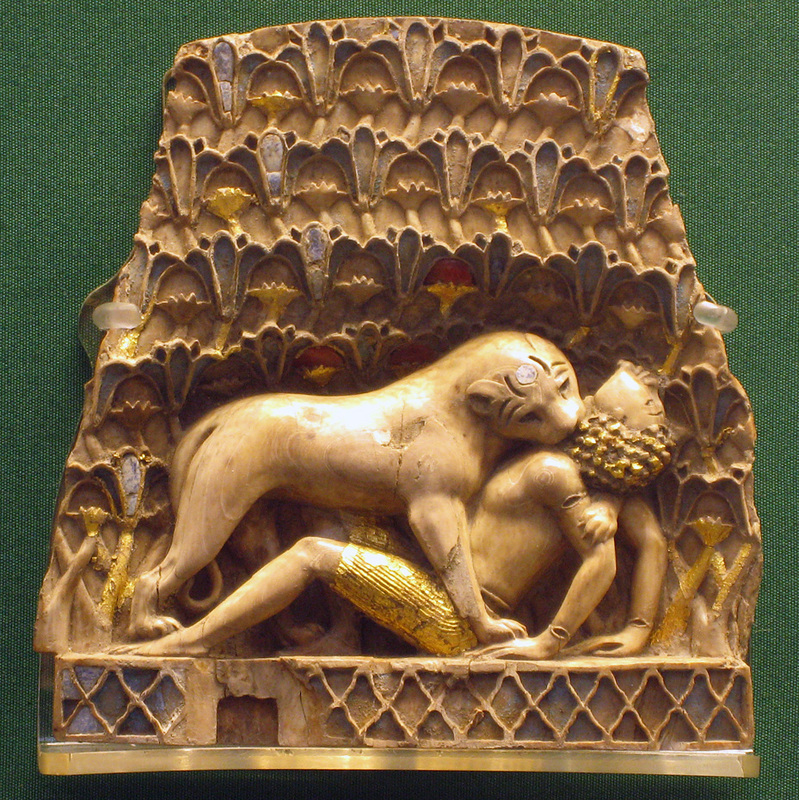 ^ "BBC - History - Ancient History in depth: Mesopotamia". http://www.bbc.co.uk/history/ancient/cultures/mesopotamia_gallery.shtml. ^ Milton-Edwards, Beverley (May 2003). "Iraq, past, present and future: a thoroughly-modern mandate?". History & Policy. United Kingdom: History & Policy. http://www.historyandpolicy.org/papers/policy-paper-13.html. Retrieved 9 December 2010. ^ a b Derbyshire, David (2010-01-20). "Most Britons descended from male farmers who left Iraq and Syria 10,000 years ago". London: Daily Mail. http://www.dailymail.co.uk/sciencetech/article-1244654/Study-finds-Britons-descended-farmers-left-Iraq-Syria-10-000-years-ago.html. Retrieved 2010-12-10. ^ "Migrants from the Near East 'brought farming to Europe'". BBC. 2010-11-10. http://www.bbc.co.uk/news/science-environment-11729813. Retrieved 2010-12-10. ^ "BBC - History - Ancient History in depth: Mesopotamia". http://www.bbc.co.uk/history/ancient/cultures/mesopotamia_gallery_03.shtml. ^ Otto E. Neugebauer (1945). "The History of Ancient Astronomy Problems and Methods", Journal of Near Eastern Studies 4 (1), p. 1-38. ^ George Sarton (1955). "Chaldaean Astronomy of the Last Three Centuries B.C. ", Journal of the American Oriental Society 75 (3), p. 166-173 . ^ Giorgio Buccellati (1981), "Wisdom and Not: The Case of Mesopotamia", Journal of the American Oriental Society 101 (1), p. 35-47. ^ a b Sheila C. Dow (2005), "Axioms and Babylonian thought: a reply", Journal of Post Keynesian Economics 27 (3), p. 385-391. ^ Giorgio Buccellati (1981), "Wisdom and Not: The Case of Mesopotamia", Journal of the American Oriental Society 101 (1), p. 35-47 43. ^ Kramer, Samuel Noah (1963). The Sumerians: Their History, Culture, and Character. The Univ. of Chicago Press. ISBN 0-226-45238-7. https://oi.uchicago.edu/sites/oi.uchicago.edu/files/uploads/shared/docs/sumerians.pdf. ^ "Mesopotamia". Ancient History Encyclopedia. http://www.ancient.eu/Mesopotamia/. Atlas de la Mésopotamie et du Proche-Orient ancien, Brepols, 1996 ISBN 2503500463. Bottéro, Jean; 1987. (French) Mésopotamie. L'écriture, la raison et les dieux, Gallimard, coll. « Folio Histoire », ISBN 2070403084. This page uses content from the English language Wikipedia. The original content was at Mesopotamia. The list of authors can be seen in the page history. As with this Familypedia wiki, the content of Wikipedia is available under the Creative Commons License.